During my time as the editor-in-chief at The Lumberjack, Northern Arizona University's student-run newspaper, I was able to report on a wide variety of topics. From covering the 2016 election season locally and nationally, to the controversy of the San Francisco Peaks, to minimum wage, I have covered a diverse range of issues in the northern Arizona area. Some notable pieces include "Bernie Sanders: Presidential Hopeful to Power Player," a critical look at the role Senator Sanders played in the 2016 election nationally and locally; "Is it possible to survive on a minimum wage salary in Flagstaff?" an investigative piece on minimum wage in a local area; and "Arcosanti: An Urban Laboratory," an in-depth look at the power of community and Paolo Soleri in an experimental city. During Arizona’s Presidential Preference Election on March 22, Maricopa County was plagued with long lines and provisional ballots. Many Maricopa citizens waited up to five hours to vote and watched as Arizona was called for Hillary Clinton and Donald Trump while they were still in line. In Coconino County, many NAU students were turned away from the polls because they were registered to vote in counties outside of Coconino County. As the Nov. 8 election approaches, many voters are still undecided, especially when it comes to local elections. The Lumberjack analyzed what the mayoral candidates had to say during their previous debates. The candidates discussed student housing, the relations between NAU and Flagstaff, minimum wage, traffic, open space and their own qualifications. 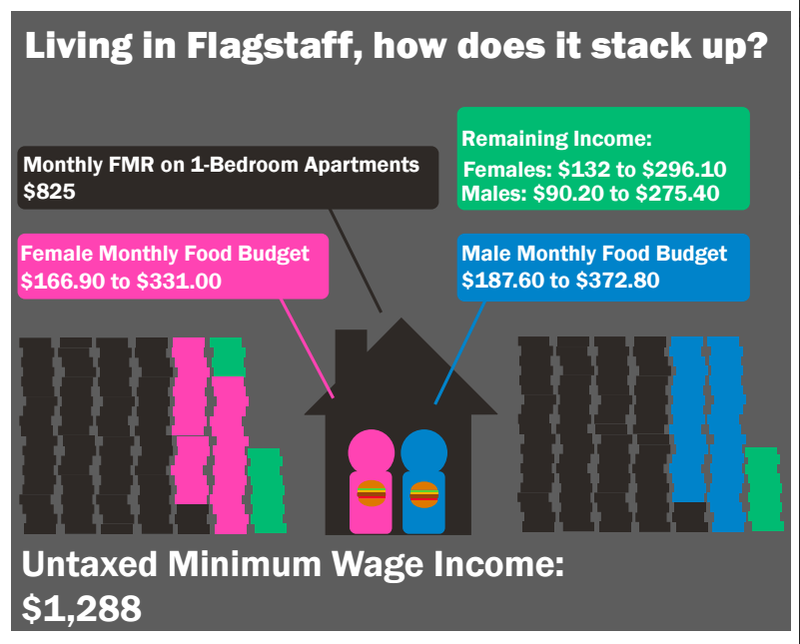 Is it possible to survive on a minimum wage salary in Flagstaff? The first few months of every semester, incoming students and residents flood the restaurants and businesses of downtown Flagstaff holding resumes in their hands looking for jobs. Most of these downtown establishments pay their workers Arizona’s minimum wage of $8.05, which some argue is too low to live on, especially in Flagstaff. Through a cloud of marijuana smoke and puddles of spilled beer, a crowd of sweaty patrons mash together to form a thick forest. The crowd huddles together with no personal space. People either stand starry-eyed or dance limply, still keeping their eyes fixed to the bright stage. Every couple of minutes hands rise and iPhones glow trying to take pictures, that are quickly posted to Instagram and Twitter. The music plays so loud it’s deafening and almost intelligible. This is the world of music festivals. Describing David Sedaris as witty would be a gross understatement. His use of vocabulary, superb comedic timing and the sharp tone of is voice made for an incredible evening. Greenhouse Productions and SUN Entertainment hosted David Sedaris for his talk on Nov. 4 in Ardrey Auditorium. As the 2016 Presidential Election approaches, more and more states across the country are becoming swing states. For the first time in 20 years, Arizona has become a swing state with the state’s Republican voting record at risk. Many cite the denouncement of Republican nominee Donald Trump by many prominent Republicans and Hillary Clinton’s record in Arizona. NAU received another visit from former presidential candidate and Vermont Senator Bernie Sanders. On Oct. 18, from 2:30 p.m. to 3:30 p.m., the senator campaigned for Democratic presidential candidate Hillary Clinton in NAU’s Prochnow Auditorium. Before noon, the line for the Sanders rally was around the corner. 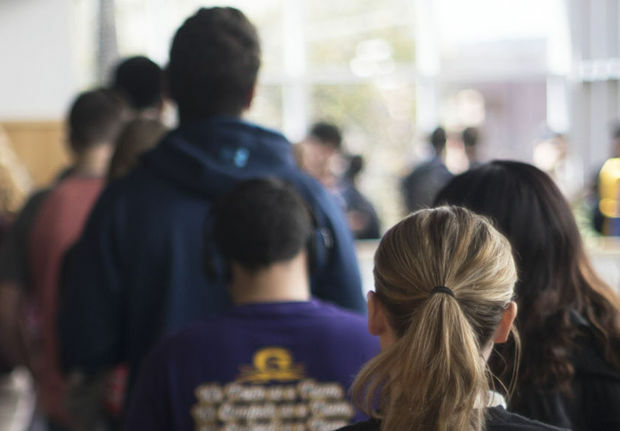 After attendees entered into the theater, people quickly filed into their seats, lined up around the corners of the auditorium and stood patiently outside waiting for the speech. From Phoenix to Flagstaff, I-17 is home to interesting exit signs with the names of random, small towns throughout Arizona. Most places are fairly well known to Arizona residents, like Black Canyon City, Camp Verde and Munds Park. However, other places remain a mystery to the typical driver, whether the person is an Arizona native. This place holds an idea, a dream, a theory all developed by one Italian architect by the name of Paolo Soleri. This place is called Arcosanti. Kayla Mueller, the American hostage whom her ISIS captors reported killed in Syria on Feb. 6, was a political science major and human rights activist at Northern Arizona University. ISIS has reported that she was killed in a Jordanian airstrike, a claim that Jordanian officials dismiss as a "PR stunt." Obama administration officials said Feb. 6 that they do not know whether the claim is true. Incumbent, Jerry Nabours, and councilperson, Coral Evans, face off for your vote in the 2016 Flagstaff Mayoral Debate covering issues in relation to Flagstaff's economy, environment and more. Presented by NAZ Today, the hour long, BEA award-winning special aired live and was moderated by Cheyanne Mumphrey and Xavier Rangel with reporting from Grace Fenlason. This Tuesday, Oct. 18, Vermont Senator and former Democratic presidential candidate Bernie Sanders returned to NAU for an early-voting rally hosted by NAU Young Democrats. Sanders is scheduled to speak in Prochnow Auditorium discussing the presidential election, raising minimum wage and funding education. In March, Sanders came to northern Arizona as a hopeful candidate and now in October, he comes as a supporter. Sherman Alexie, the renowned and prolific author and filmmaker visited ASU Sept. 29 as part of the Flinn Foundation’s Centennial Lecture Series. Alexie and a small crowd of less than 100 people gathered together at the Tempe Center for the Arts. Interestingly, the study of Alexie’s books in schools were banned in Arizona in 2013 by Arizona House Bill 2281. 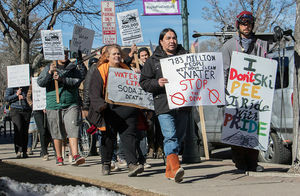 As snowboarders weaved down the slope between Cherry Avenue and Birch Avenue, protesters marched next to the man-made snow chanting “save our water, don’t do the dew” and “no justice, no peace, save our peaks.” Jan. 24 and 25, Flagstaff citizens protested the popular Dew Downtown Urban Ski and Snowboarding event where local skiers and snowboarders compete and demonstrate their abilities.